As a Hartford Wedding Photographer I experience a variety of scenic and historical areas located within the city. Hartford is the capital of Connecticut and is the state’s third largest city after Bridgeport and New Haven. The city was established in the 1600s, and therefore it is home to a number of historic monuments and buildings. If possible, a Hartford Wedding Photographer will try to incorporate the city’s landmarks into the pictures he takes. The picture above shows a bride and groom standing at the top of a set of stone stairs that lead to one of these landmarks. At the center of the photograph a pillar stands tall and proud. This large, stone monument is surrounded by a wall of the same color stone and is situated at the center of a wide circular platform. The grand stairway is wide and steep, leading up to an opening in the stone wall that gives visitors access to the monument and to a view of the city. In this image tree branches sway in the background, at odds with the stoic stability of the pillar at the center of the picture. The bride and groom stand to the right of the monument, gazing into one another’s eyes. It is a cloudy day, but the hearts of the bride and groom shine brightly in this moment together. The groom wears a tuxedo and the bride wears a mermaid style gown. The bride’s dress ends in a flurry of white fabric bunched into ruffles that dance around her feet as the groom holds her close. 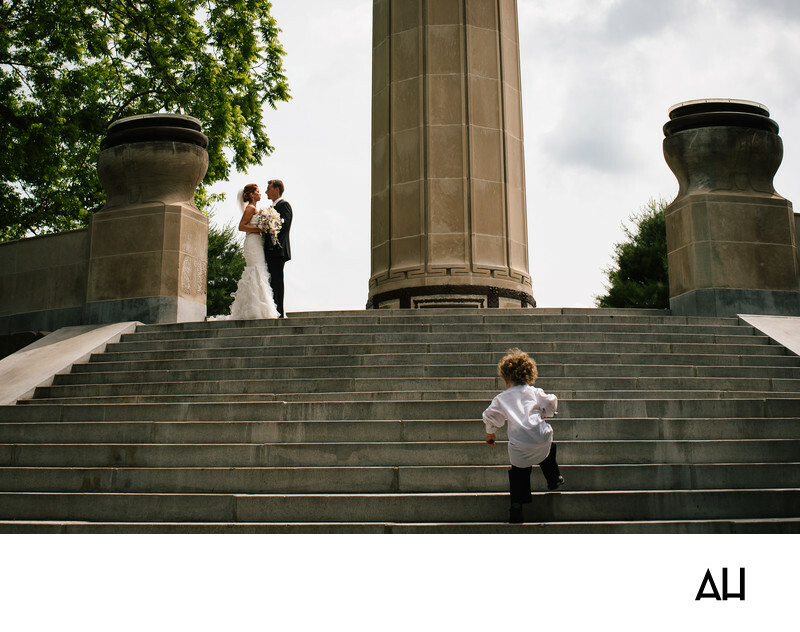 Also present in the picture is a small boy, the ringbearer, who runs up the steps to greet the newlyweds. He spent the morning staying still and wearing a nice suit. Now his jacket has been discarded, his shirt is untucked, and his blonde curls are in disarray as he playfully charges up the stairs. The moment is frozen in time and captures the love, grandeur, and pure fun that made this day so special. Beautiful venues include Wadsworth Atheneum Museum of Art, and Society Room of Hartford. Elizabeth Park and the City Hall are great for bridal party and wedding portraits.